Known for its rich culture and vivid traditions, the bijou town of Dharchula is located in the heart of Pithoragarh district of Uttarakhand. It is perched at an elevation of 915 metres and is a major destination of the Kumaon region, lying on the Kailash Mansarovar and Chota Kailash route. The quaint town of Dharchula is encircled by the towering peaks and is situated in a pristine valley located on the banks of Kali River. One can also have a panoramic view of the mighty Panchachuli peak located to the west of Dharchula. Why you shouldn’t miss out Dharchula while travelling to Kumaon? Dharchula is celebrated for its unique culture and traditions which are a mixture of the major ethnic groups of Uttarakhand namely the Kumaoni and Shauna communities (also referred as Bhotiyas). The tourists can have a sneak-peek into the culture of the locals who are very polite and shy by nature. Dharchula is rich in natural vegetation and one can also find few dry fruits trees here. Wild animals such as deer, bears, foxes, and leopards can be easily spotted here. Some of the popular tourist attractions located in the proximity of Dharchula are the Narayan Ashram, Mansarovar Lake, Chikrila Dam, Kali River and Om Parvat. Dharchula is also an important camping site en-route Kailash Mansarovar, Chota Kailash, and Narayan Ashram route. While visiting Dharchula, don’t forget to buy the local handicraft items and regional delicacies which are quite famous among the tourists. 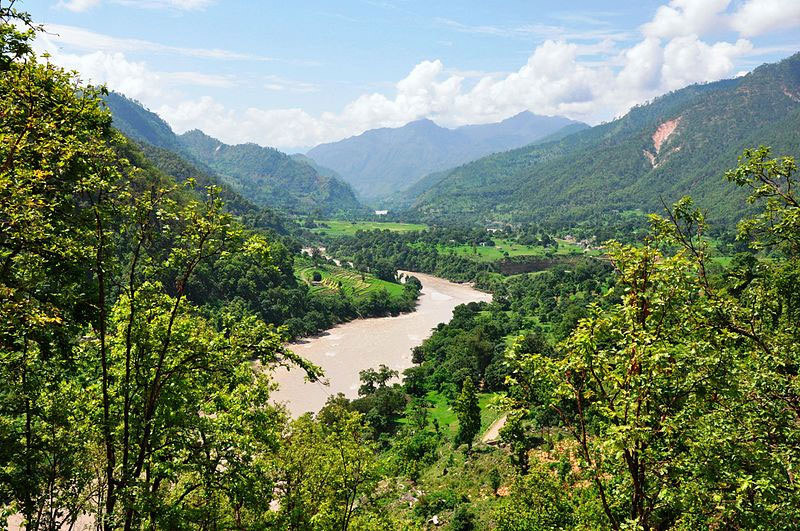 Nature Walk: The mesmerizing natural beauty that encompasses the secluded town of Dharchula is quite mesmerizing with undulating hills, lush green forests, gushing river and verdant pastures. One can easily set out on a nature trail and explore in and around Dharchula. Village Tourism: Situated on the banks of Kali River, Dharchula is a village with a mélange of vivid cultures and customs. As the village is situated close to Nepal border, it has imbibed both Kumaoni and Nepali culture. There is also a local lore related to Kangdali festival which is celebrated by the Shauka and Rang communities also known as Bhotia tribe, having its largest settlement in Dharchula. The myth narrates the story of a boy who died an untimely death after applying the paste of a shrub called 'Kang-Dali' on hisboil. Anguished, by the death of her only son, the widowed mother then cursed the shrub and asked the Shauka women to uproot the Kang-Dali plant when it flowers,which happens once in 12 years. Hence, Kangdali festival is celebrated. The summer is pleasant at Dharchula while the winter gets really chilly. Unfortunately, it doesn’t snow at Dharchula. The locals are very welcoming and friendly in all of Uttarakhand and one can easily interact with them and understand their culture, customs and way of life. Dharchula is a small remote town located in the Pithoragarh district of Uttarakhand. Being a secluded and lesser known place, there are not many accommodation options at Dharchula for tourists. Only a handful of budget guesthouses with limited facilities and amenities are available. In addition to that, government owned guesthouse KMVN is also established at Dharchula. It is quite difficult to find a decent restaurant in Dharchula that serves variety of cuisines. At best, one could find roadside dhabas and foodstalls that serve people on the go. These dhabas serve variety of North Indian dishes and popular Chinese cuisines like Springrolls, Noodles, Manchurian etc. Apart from that, one can try local Kumaoni cuisine if one is able to find a restaurant serving the Pahadi dishes. Dharchula was an ancient trading town on the trans-Himalayan route and like other regions of Kumaon, before independence, it was ruled by several princely states like Katuris and much more. The main occupation of the Rangs (Bhotias), the natives of Dharchula were sheep rearing and trading. 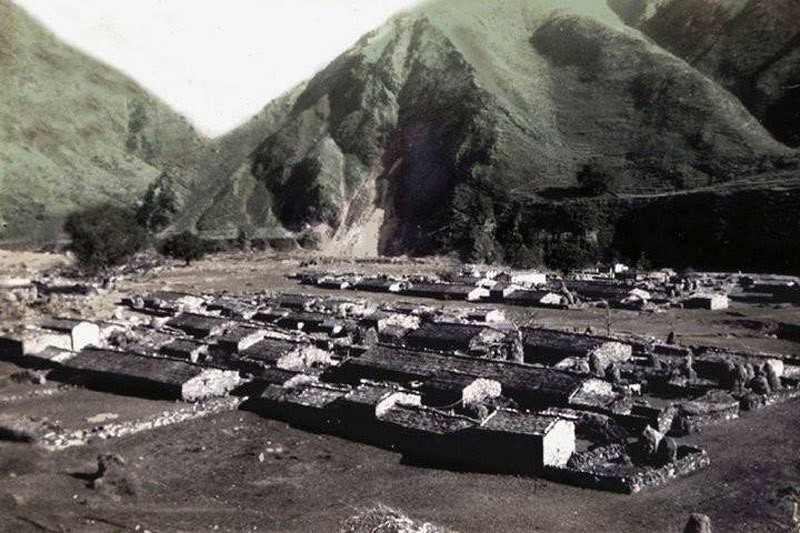 Before Indo-Chinese war, Dharchula was one of the major destination where the trade took place between India and Tibet. During this period, Dharchula was a hub for spinning, weaving, natural dyeing of wool and also used to manufacture traditional dresses in abundance. On the closure of this route during the Indo-China war of 1962, the Bhotia people settled in Dharchula instead of using it as their summer home. It is also believed that Dharchula is the traditional route of the famous Kailash Mansarovar Yatra. Dharchula serves as the gateway to the holy Kailash-Mansarovar Yatra. It is believed that many sages and ascetics chose Dharchula as their meditational grounds; the highly revered among them is sage Byas Muni. According to a popular Hindu legend, sage Byas Muni used the area between the three mountain ranges surrounding Dharchula to light his stove, hence Dharchula got its name from it, ‘Dhar’ meaning edge of a mountain and ‘Chula or chulah’ meaning stove. It is also believed that Pandavas of the Mahabharata visited this place during their12 years long exile. The beauteous town of Dharchula serves as the meeting grounds of Kumaoni, Shauka, and Nepalis during the grand Jauljini Festival. This pompous fair is held annually in the month of November, at the confluence of the Kali and Gori rivers near Dharchula. The ideal time for visiting Dharchula is between the months of March-June and September-December. Dharchula is a Nagar Panchayat in Pithoragarh district of Uttarakhand. Surprisingly, Nepal cradles a similar town by the name of Dharchula located across Mahakali river, acting as a natural border between India and Nepal. What is Dharchula famous for? Dharchula is famous among tourist as Business Hub, Near by Trekking Routes. Dharchula is popular destination for following activities/ interests - Base Camp (Trek), Business Hub. Travelling to Dharchula in 2019? Contact us for planning your Dharchula tour with best travel packages of as per your requirements!